because it is his natural characteristic, so the artist works. 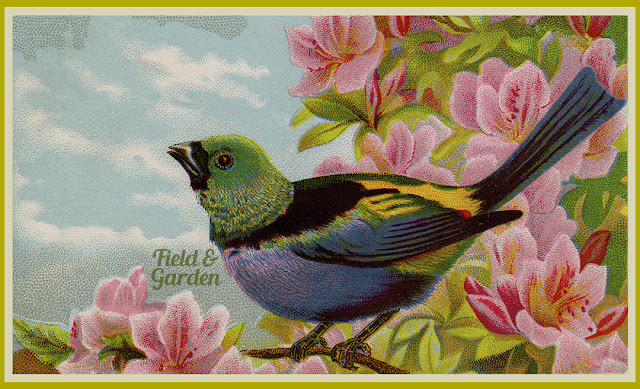 Fabulously colourful bird illustration from an old Victorian trade card (VTC) in my collection. I am not sure if this brilliant fellow is a real bird or an imaginary one but I really admire how his green, purple and yellow feathers stand out so nicely against the showy pink rhododendrons in the background. You can download the free high-res 4.25" x 7" @ 300 ppi JPEG without a watermark for journals, scrapbooks, bookmarks, gift tags and all kinds of other design projects here.